Note to all future taggers: I'm a horrible person to tag for any picture related tags. Here's why: I've been tagged by Icy BC and the rules for this tag are to select the 8th photo in the 8th photo folder and write about it. Since this tag only calls for posting a picture and nothing complicated, I'm going to follow along. I have to admit, I was hesitant because I'm not a photographer and I don't have 8 photo folders. That was my first problem. My second problem was in my 4th photo folder (that's all I have), the 8th picture was a picture of my sister goofing around and she made me promise that I would never post any pictures of her on my blog. So I have to break away from a couple of the rules and post the 9th picture from the 4th photo folder. Additionally, I'm not going to tag 8 bloggers but would leave it with anyone who would like to join this tag to please do so. This is my sister's teacup chihuahua named Apple. Apple was slightly bigger than an iPhone at birth. Her friends gave it to her as a birthday present and the dog was certified as a 'teacup'. I believe Apple was 5 months old in this picture. Apple is 5 years old now and she is no teacup. Not sure if it was because we fed her too much or because she was not a teacup to begin with. She's grown into a normal size chihuahua. My, she's tiny!! :) I never thought there are breeds of chihuahuas even smaller than the "regular" chihuahuas. aww what a total cutie!! i'm quite bad at tagging and posting for groups too so haven't got my head around to it. might join it when the boredom starts to kick in...again! Awww!! How precious! So little!!! Oh so tiny, so sweet when they are that age - is Apple as sweet now that's she's grown up? What a surprise! I've never heard of teacup chihuahuas. The pup is certainly adorable! That's such a cutie dog. I am abit afraid of handling teeny dogs like that as they're so fragile-looking. OMGawd, so cute!!!!!!! I'm a real fan and owner of tiny ones eg chihuahua and miniature pinscher. You're funny. I think memes and tags are meant to be interpreted any way you want ;) That is one cute puppy...so tiny! Apple look so sweet, like a delicate sleeping beauty. So peaceful too. Apple next to an Apple... how poignant! What a sweet photo you've shared! Well whatever folder that came from I'm glad you posted it. That is the cutest picture ever! That is soooo cute! 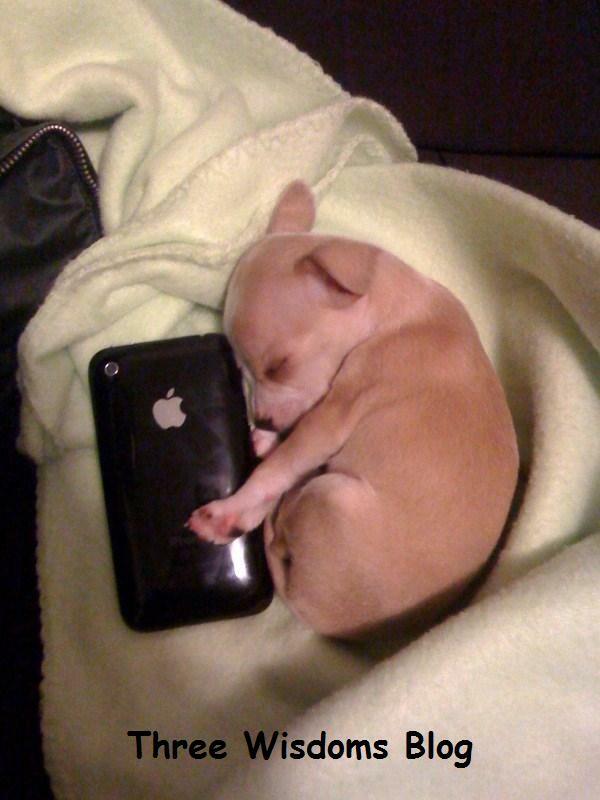 I love Iphones and sleeping puppies! I know what you mean about being tagged. I feel the same way. The chihuahua looks really cute! But I am no big fan of chihuahuas - especially grown up ones. haha! Oh my goodness...that's seriously tiny! I can literally put in my pocket and walk around! than the size of my palm. She's a big girl now. Apple is so cute sleeping next to Apple Iphone! Thanks for playing along, RoseBelle..What a precious pup!